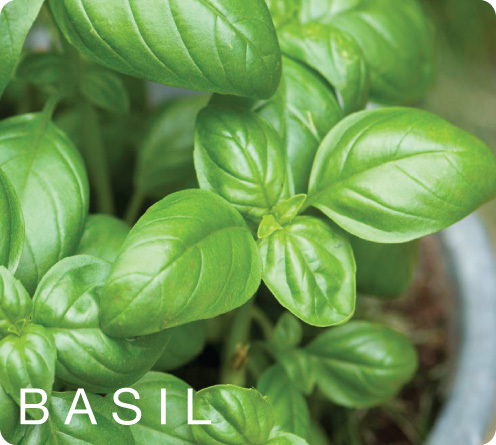 Basil is an aromatic herb; its fragrant leaves are used either fresh or dried as flavoring. It contains oils, vitamins (A, C & K), and minerals such as iron, calcium, magnesium and potassium. The main use of basil medicinally is as a natural anti-inflammatory, it is used to combat bowel inflammation and rheumatoid arthritis. Basil contains cinnamanic acid, which has been found to enhance circulation, stabilize blood sugar, and improve breathing in those with respiratory disorders. Fresh basil leaves and basil oil have antibacterial properties can assist in combating common viruses like colds and flu and helps boost the immune system. It also has antioxidant properties, which can help prevent cellular aging.